^ a b Bradley, Kurt (2016-11-26). "Driving This JDM Honda Civic Type R Was As Perfect As I Imagined". Jalopnik. Retrieved 2018-03-03. ^ Ingram, Anthony (2015-03-10). "Should you buy a Honda Civic Type-R (EP3)?". Evo. Retrieved 2019-03-03. ^ "Civic Type R EP3 JDM". Piston Heads. 2015-06-15. Retrieved 2019-03-04. ^ "Honda Civic Type R EP3 Buying Checkpoints". Evo. 2013-03-14. Retrieved 2019-03-04. ^ a b Baker, Guy R. (2015-06-01). 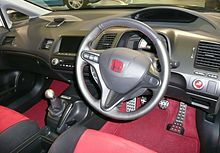 "Honda Civic Type R (EP3): Market Watch". Piston Heads. Retrieved 2019-03-04. ^ Go, Aurick (2016-01-18). "TAS 2016: Honda unveils Mugen Civic Type R Concept". Retrieved 2019-03-04. ^ a b c "Honda Civic Type R review". What Car?. Retrieved 2019-03-04. ^ Robinson, Matt (2019-03-03). "FK2 Vs FK8 Honda Civic Type R: How Much Has The Game Moved On?". Car Throttle. Retrieved 2019-03-04.